Preschool or Kindergarten graduation photos are special keepsakes for both your little graduates and their families. But, what’s the best way to capture all those special memories? We have a few ideas that will help make graduation photos fun and memorable for you and your kids. The first thing to decide is how you want your photos to look. Do you want formal photos, casual pictures, or both? 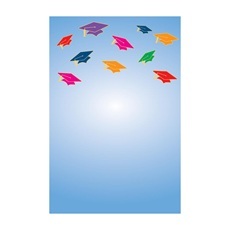 For formal graduation photos, have kids wear their graduation apparel and pose for photos in a controlled setting. If you want more casual grad photos, have your kids wear everyday clothes or a graduation t-shirt and cap, and take fun, candid shots, both indoors and outside. You might find that some of the best photos you get will be of kids being kids in their everyday environment. Try to get some candid photos of your kids both in grad gear and everyday clothes doing what they love to do in class–reading, seat work, playing, napping, etc. Choose the best photo of each child and put it in a personalized frame as a graduation gift for parents. To make graduation photos even more meaningful, consider adding someone else into the shot with your little graduate. This could be a teacher, family member, best friend, or even a pet. The best way to get awesome graduation photos of your kids and their parents is to have a party. Whether you have a small gathering before the ceremony, or a big bash afterward, make sure you capture all the special moments on film. No matter what you choose to do for graduation photos, be sure that parents get copies of all the pictures of their kids. Create a special collage or folder for each child or compile all the photos into a memory book to commemorate the year. Parents will cherish these special mementos of their children’s big day. How do you capture graduation memories at your school or center?